This activity is ideal for early on in the collection or in the middle. I printed out each of the five poems they had read for homework and taped each one (separately) into the middle of a five larger poster boards. I created five groups of students, one for each poem. Each group had a different color marker, so I would know what each group had written. The groups would each start with one of the five poems/poster-boards, read it out loud, then write their answer to question number 1 (see below) in the blank space of the poster board. After about 8-10 minutes, they would switch to the next poem, read it out loud, and answer question number 2. Again, they would spend about 10 minutes, then rotate again until all 5 poems and questions were covered. The final task was to return to the very first original poem poster they had, read everything and discuss everything together. Do they agree with the other groups’ notes? Do they have anything to add? They could discuss the poem further either in conversation, or you could also have them reflect on the poem one last time in writing. 1) What is the poem about? Define unknown words. 2) Consider structure – couplets, tercets, prose, other? Also any use of italics. 3) Unique or surprising images – what do they convey to you? I have 50-minute class periods, so by the time we got settled, explained the directions, made groups, and spent time rotating, it took us almost two full class periods to finish the five poems. VARIATION: I did the same exact poster-board set up with the next five poems in the book, made five student groups again (different people this time in the groups), but instead of rotating poems for each question, the groups all stayed with the same poem for the whole time. Meaning that they answered all five questions for the same poem, no rotating. I offered an extra credit point for the best poster, which helped them to be more motivated to write quality annotations. It was spring and they were seniors, so any extra motivation boosts are always a bonus. In a small group, students chose a poem from last night’s reading to create a graffiti wordle for. Well, it’s not technically a wordle, because it’s not the frequency of individual words that matters, but the importance of them. This activity is great for thinking analytically about diction in a poem. 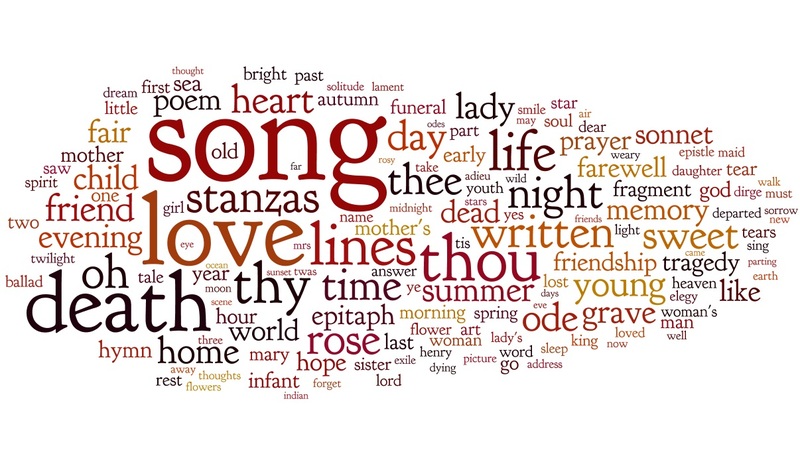 As a group, they decide which three words in the poem are the most important to feature as the biggest-sized words in their wordle. Being that this is a modified wordle, I couldn’t find any online generators that would allow students to create a wordle any other kind of way than by word frequency. Hence, my calling it a graffiti wordle. The graffiti aspect comes in because they draw it by hand. Students continue to rank word importance and add to their wordle accordingly until all words in the poem are included. This activity is ideal for early on in the collection or in the middle. Here are some things I asked them to consider while crafting the graffiti wordle, which you could have them write up into a reflection. This one was my favorite of the three and really got the students motivated. Ideally, this activity would be best at the end of the collection, probably on the day they return from reading the last five poems. Again, I used extra credit to the winning group for encouragement, along with bragging rights for crushing their opponents. Either from the poet themself, or as a class, you need to create a list of theme seeds explored throughout the collection. We were fortunate to be able ask RA Villanueva (via Twitter DM) which particular themes he would like us to explore in his book, to which he responded: memory, masculinity, joy and grief, faith, and family. You need as many theme seeds as however many groups you would like to have. We were given five themes, so we had five groups, with each group being assigned a different theme. Students had an entire class period to go through the collection and find textual evidence to argue that their theme was the most important theme to the book. Students gathered ideas, collected quotes, and prepared a list of reasons to use the next day in our debate. We started the next day off with opening arguments. Each group had one minute to present a little introduction to their theme. After all groups shared, each group then had three minutes to argue in Round 1. I allowed groups to make the decision of presenting – they could all take turns talking in the group, one person could talk for three minutes straight – it was up to them. After each group presented their Round 1 argument, I had the rest of the groups take a one-minute break to jot down notes for crafting a formal rebuttal later. After all Round 1s went, it was time to start the Rebuttals. Each group had 1.5 minutes to address the other groups and negate the Round 1 arguments. After all groups had a chance to rebuttal, I as the official judge, ruled out two of the five groups with the weakest arguments. These two groups now became my co-judges to decide the overall debate winner. The remaining three groups had a two-minute Round 2, after which we ruled out another group. The last two groups presented their closing arguments. After the closing arguments, the groups no longer in the running helped me to choose the winner. It was a lot of fun; the kids got really into the competition, and everyone was engaged the entire time. In total, from gathering textual evidence to picking a winner, it took us three class period to complete. I hope you can use some of these ideas in your own classroom with poetry collections you choose to teach to your students. You can also check out aplithelp.com and the Poetry Foundation for more useful ideas for teaching poetry. This post on aplithelp.com is also about teaching a poetry collection and offers more engaging ideas for activities.